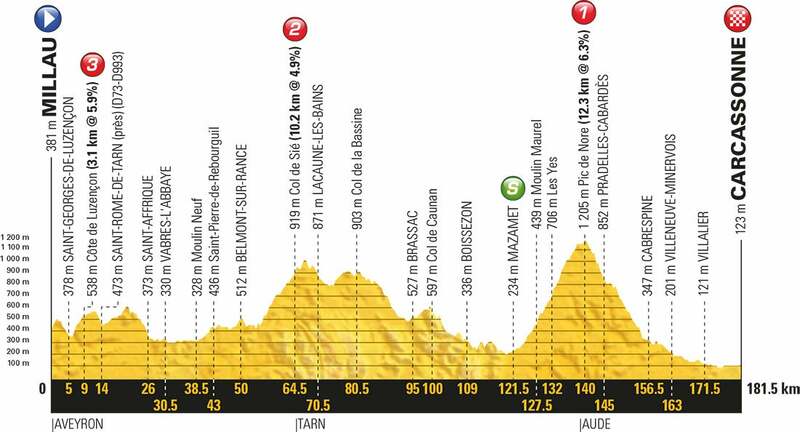 Stage 15 will be a second consecutive stage for the strong men. It’s even more likely than on stage 14 that a breakaway could attack from a long way out and manage to stay clear on the ascent of the Pic de Nore, which comes 40 kilometers from the finish. This is a difficult test (12.3 kilometers at an average of six percent) that will eliminate the specialist sprinters and favor fast finishers who can cope with the hills, in the mold of Sagan and Valverde. Depending on the number of riders who cross the summit together, the last 20 kilometers of descending false flats and valley riding could be very interesting. Groups that are on the attack will come together. Magnus Cort Nielsen made it two wins in as many days for his Astana team when he crossed the line on stage 15 of the Tour de France. The Dane outsprinted Ion Izagirre (Bahrain Merida) and Bauke Mollema (Trek-Segafredo) to take the victory out of a select breakaway group. There was no change in the GC standings as Geraint Thomas led the group of overall contenders to the line 13 minutes after the stage winner. “This is a dream come true. I’m very happy to take a victory, and I have to thank my team a lot for going me this chance and really believing in me, and especially also Michael [Valgren] in the final,” said Cort Neilsen after the stage. Cort Neilsen, who’s win came in his maiden Tour de France, said his Astana team directors had planned his stage 15 win over the last few days. The 181.5-kilometer stage ran from Millau to Carcassonne, and marked the last day of action before the rest day and a series of stages in the high mountains. The day was tailor-made for breakaway artists and included three climbs before a long descent into a finale in Carcassonne. Competition for the day’s break was stiff, with riders knowing the GC favorites lacked the appetite to contend for the stage. A massive 28-rider breakaway eventually got away, and with world-class firepower like Peter Sagan (Bora-Hansgrohe) and Greg van Avermaet (BMC) in the group, they quickly built up an insurmountable lead. Lilian Calmejane (Direct Energie) was a favorite to contend for the stage victory, but the young French rider set off on a doomed solo attack with roughly 100km remaining. He was reeled in well before the stage’s final climb, which saw a number of riders make moves off the front in an effort to ride clear. Sagan’s teammate Rafal Majka rode away on the climb, but was reeled in by a select chase group on the long, exposed descent. With 7km to go, Mollema, Izagirre, and Cort Nielsen snapped the elastic to the rest of the breakaway, and pushed on together to the finish line. The far superior sprinter, Cort Nielsen, marked an attack by Izagirre inside the final 2km. The raw strength of the Dane likely intimated his breakaway companions, and they failed to mount any further attacks as they rode into a sprint they were certain to lose. When Cort Nielsen opened up his final sprint, he powered away and crossed the line for a definitive victory. Back in the GC group, Dan Martin (UAE Team Emirates) attacked on the final climb. He pulled out a gap of a minute by the summit with 40km remaining, but he was easily reeled in by the well-oiled Sky train on the long descent. Romain Bardet (AG2R La Mondiale) attempted to put Sky under pressure on a technical portion of the descent but nearly came to grief himself. Race-leader Thomas said he and his Sky team weren’t concerned about the late-race moves from the outside contenders. “It was a tough day to try to do too much. Dan went, and bold move, but he wasn’t really going anywhere on his own. As they got closer to the finish line, thoughts of the rest day likely loomed large in their minds as the group fanned out across the road and slow-rolled the final few kilometers. When asked about how he will do in the final week, Thomas reiterated that he is simply taking the race day-by-day, but did note that he tends to come out of rest days on good form. “It’s a rest day now and then a big week. We’ll just keep doing what we’re doing, you know, day by day and try to do everything right. We’ll see what happens. Unfortunately, Thomas heads into the final week down a key teammate. Gianni Moscon was ejected from the race following the stage for punching Frenchman Elie Gesbert (Fortuneo-Samsic) 800 meters into the stage. After tomorrow’s rest day, the race resumes on Tuesday with the first of three Pyrenean mountain stages.